I like how the CoV pretends they have a timing system for traffic lights....they clearly don't. Actually they sort of do for some stretches of road...at least for a while after they get reset. But then over the following months the lights slowly go out of synch until eventually it's almost random. The lights on Pandora from Cook to the water were synched quite well for about 40-45 kmh when the bike lane opened (provided there wasn't much traffic), but that's not so much the case now that some time has passed and tiny timing differences have added up to throwing them out of synch. The city has undertaken a traffic light study, no? A fleet of dump trucks is stationed along the former travel lanes of the Trans Canada Highway at McKenzie Avenue and Admirals Road. The through-lanes of the highway were recently re-aligned in order to make way for the "big dig," the excavation of the future Trans Canada Highway travel lanes that will flow below the McKenzie Avenue and Admirals Road overpass. As the McKenzie Interchange project inches ever closer to its summer opening date, workers are making progress on the “big dig” portion of the $85 million Trans Canada Highway improvement, according to the Ministry of Transportation. Motorists and travellers passing through one of B.C.’s most congested intersections – the nexus of the Trans Canada Highway, McKenzie Avenue and Admirals Road near the Saanich and View Royal border – will see big changes in the coming weeks as crews continue to excavate the path of new highway lanes that will flow below the route's existing grade in order to make way for the McKenzie Avenue and Admirals Road overpass. Is the pedestrian overpass permanent or will they be putting in something else? The north-south pedestrian overpass is temporary and will be replaced by the actual overpass. They are building a new pedestrian overpass in addition to the actual overpass though. Ah, that’s right, indeed it will be replaced. So what exactly is that pool of water in the center of the clover leaf supposed to be? Is it to give the false impression that the project is at one with nature and some wetlands are to be restored or something? Maybe its a run off collection pond, maybe not. No certain it is there to give a "false impression" though. I'm wondering what this massively "denuded of trees" section of the former Cuthbert Holmes park is intended to be? This view doesn't really show how far back the "clearing" goes, but it goes back a very long way. It is much more area than would be required in order to widen (or twin) the Burnside exit lane from Admirals, and it seems far too comprehensive of a clear cut to be simply a temporary construction lay down zone. Anybody know what the plan is for this location? Because it's so far away from the actual overpass construction area, it seems not to be detailed on any plan I can find. Based on the project website, the area was cleared of invasive species and will be replanted. There will be a trail along the highway, too. 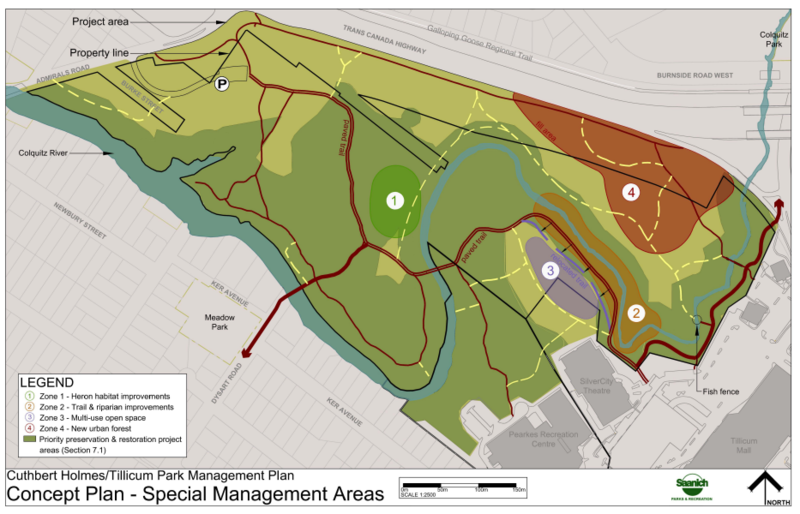 The Cuthbert Holmes Tillicum Park Masterplan (2015) designates the scrubby area between Colquitz Creek and the highway as "new urban forest," so i imagine the Province is working with Saanich on a replanting program. Thanks for that ... the "new urban forest". They have dumped tons upon tons of gravel and dirt (presumably from the interchange project itself) on this site. I think the build up is meant to be a sound barrier between the highway and the park. Once planted and seeded with grass will look much better from inside the park then those concrete walls being built elsewhere along the interchange. Perhaps, although as I live near the site, I visited that area and I can report that it's not a "barrier" inasmuch as it's a "large plateau" ... which is to say it's built up not as a wall, but as a feature which has raised more than a few acres of land up over a somewhat large distance back into what was the former much lower lands in the park itself. If it is a sound wall, it will certainly work as it's a few hundred feet thick! If I was being a devils advocate, I'd have to ask if it wasn't just a place to conveniently dump all their dirt and gravel once removed from the actual interchange site. Anyway, it will be interesting to see how they reintegrate it into the park. If I remember correctly though, they dumped all that dirt there before they started digging. They may of added more since then, but this stuff was done first thing when they added all the fill for the ramps, et al. 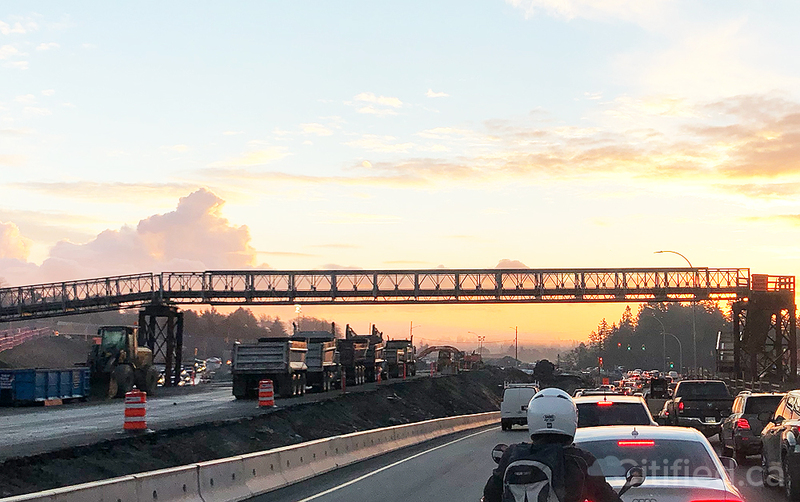 With the announcement from the province and the feds that the southbound bus lanes will be funded (from Burnside bridges to Tolmie), won't that hinder southbound traffic flow for about a year when the new interchange is open? There's no mention in the current release when construction will start on that project.